First of all, there's some minor news about the Sengoku Basara anime series in the UK via the local license holders, Manga UK. The series has had a rocky history here; the first series had an optimistic release as separate DVD and Blu-ray sets back when the latter format was still struggling to catch on, and as fans of the anime might know, the English-language releases have fewer extras on the DVD editions (most notably, some of the cute Mini Sengoku Basara shorts are missing). Although I bought a copy to show support and bullied half a dozen friends into giving the show a try, it seems that the first season sold poorly enough that at one point Manga UK's representatives were saying the second season of the anime wouldn't be coming over here at all. Funimation in the US dutifully released a DVD/Blu-ray combo pack for the second season complete with chipboard box and preorder bonus, and for a while it looked as though fans in the UK would have to import. Until Manga UK abruptly changed their mind and released the second season as a barebones DVD-only collection - which I cannot recommend to anyone since once again, several of the charming Mini Sengoku Basara shorts aren't included. In spite of this I'd assumed that the theatrical movie Sengoku Basara -The Last Party- would make its way over to this country in due course to complete the series; films tend to sell better than television anime, after all. However, the likelihood of the movie ever making an appearance here seems to have hit a major snag. There was an interesting segment on the most recent Manga UK podcast (#18) where a fan asked whether the company would be licensing any more shoujo or josei anime titles for distribution in the UK. Manga UK representative Jerome struggled to think of any shoujo in the company's anime catalogue off the top of his head and eventually chose Sengoku Basara as his example. A rough transcript of the answer follows (if you want to check the full version, skip to 73:30 in the podcast linked above). "Isn't Samurai Kings/Sengoku Basara josei? Because that's purely aimed at women in Japan and that's why it did so badly here (laughter). It's a male-centric action show which for all intents and purposes looks like shounen - but it has not connected with the audience in the UK at all. It's bizarre. The audience for Sengoku Basara in Japan is more mature women; it's weird. Apparently it's because they really like the eye candy, they like the male characters, they like... you know, the stuff. We bought it probably under the misconception that it was shounen and based on a Dynasty Warriors style video game with a lot of melee battles and action; and there is a lot of action in this show. It started to ring alarm bells when the licensors took me around an Animate store in Shibuya that caters primarily to female otaku, and Sengoku Basara was everywhere. It was the biggest... (JC: Mature female otaku are only 12% of the otaku audience, so that's immediately cutting out 88% right there.) Yeah, that's sad. So probably no; unless the show is really doing well in Japan, getting good simulcast numbers overseas and a fair bit of hype and it comes to our attention, then probably no, I'm really sorry - it just doesn't sell enough." Well. Looking past the complete dismissal of the male fans the series seems to have overseas (and the number of female fans who buy shounen), I think Manga UK's release of the first season was one of their better quality productions - they even timed it to coincide with the disastrous European release of Sengoku Basara 3 (Samurai Heroes). Perhaps they were simply expecting too much. Jerome started to say it hadn't connected with the "Naruto audience" before changing his wording, and if their hopes had been that high then it's no wonder that the Sengoku Basara anime ended up being a bitter disappointment in comparison. Nonetheless, it's a shame that the series sold so horribly and I'm surprised at the lack of interest from my fellow countrymen. What went wrong? Anyway, on to some similarly unimportant news from Japan! 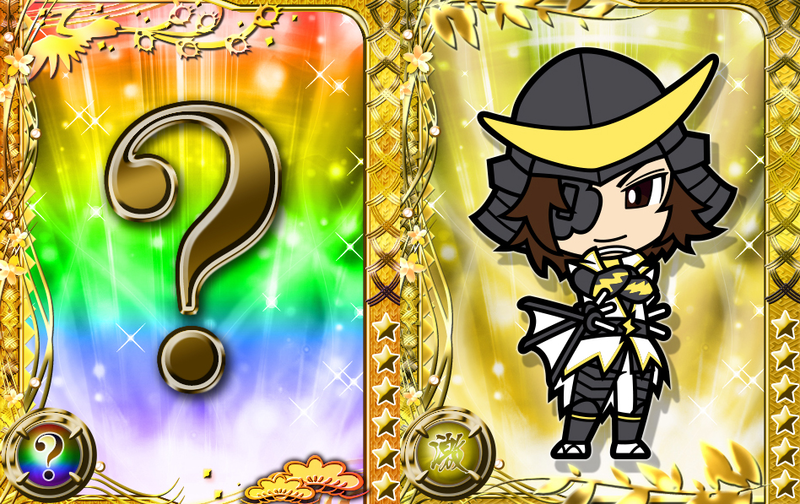 Mobile game Sengoku Basara Card Heroes Matsuri is celebrating its first anniversary on 29th May 2013 with a series of in-game events. Users who log in during the campaign's 'coundown period' between the 21st and 29th May 2013 will receive a SR Katakura Kojuurou card (pictured). 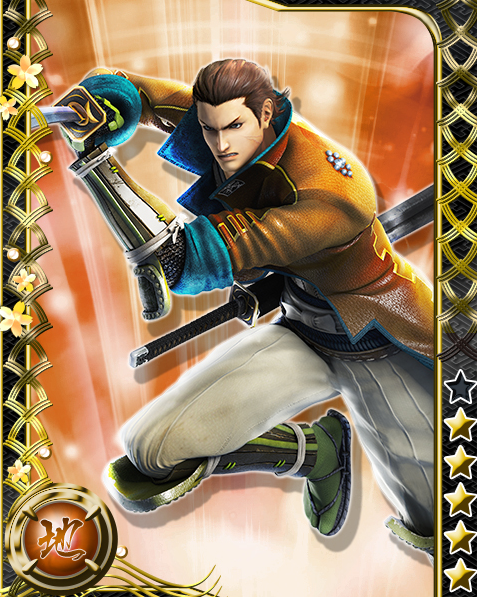 Kojuurou often seems to be used for rewards when it comes to the Sengoku Basara mobile games - not that I'm complaining! Once the countdown has finished, players are assured that there'll be more to look forward to with additional festivities until 4th June 2013. 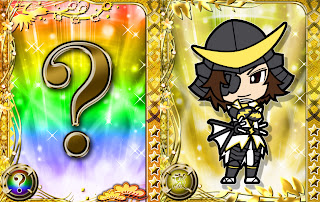 Most mysteriously, there will be a new card created for the character who received the most votes in the in-game popularity vote which took place from 30th April to 8th May 2013. There'll also be various stat bonuses and a limited edition Date Masamune card to buy. I want to see the results of the character poll most of all. The demographic of players who would vote in the mobile game is slightly different to usual, so there might be some weird surprises. As a male SenBasa fan living in the US (my girlfriend is currently living in the UK and became a Basara fangirl through me, funny enough)and just a fan of the franchise in general, I have to say that some things said by Manga UK in general there seem a bit suspect. I mean, over here, the anime has been a very good cross gender title, cause while the fangirls are jumping into a very well populated franchise with already more BL doujinshi then they know what to do with and TONS upon TONS of merchandise, as well as lots of popular seiyuu in one place, the guys got really well done, ridiculously over the top action scenes, and hotblooded manly men (who may be good looking but male fans seem to be selectively biased when it comes to excusing someone awesome based on how they look but I digress, like a Gurren Lagann or One Piece. So I'm rather surprised and a bit "huh?" at the notion that only women like SenBasa in any format, especially when I know that, while not making up a majority, guys do attend events for it. Course, the issue could also be that they were counting too much on the realese of the third game, both in the UK and the US, when the first game got butchered and resold to us as Devil Kings and one of the main attractions of the franchise, the seiyuu, is of course missing. Not only that but you are placing all your bets on a game in a franchise that has had 8+ years to grow and establish itself in it's home territory, where most people know the historical figures being re-imagined and appreciate the humor. I don't wanna say it couldn't work, but they should have maybe released the HD collection and 3 together and see how it went (won't say anything about Utage). Thank you for your comments! Even KobaP has gone on record to say he knows that the actual games have a mixed fanbase despite all of the female-focused BL, and almost every cosplayer I've seen representing SenBasa at UK events has been male. I'm sure that with the right marketing (and flashier cover art to give a better impression of what the series is about on store shelves) it could have done very well here. What you say about the game is true as well. I'm not a fan of the dubbed version and rarely buy dub-only games; a cheap subtitled release of one of the newer titles in the series on PSN would probably end up turning enough of a profit to be worthwhile. It bothers me how little effort was put in overall, not just by Manga UK but also by Capcom Europe. Even the simplest things they could have done to help promote the series like adding the themes and avatars from the Japanese PSN to the western stores or adding liner notes to the DVD release to give newcomers some background would have helped, and it would have cost them almost nothing. When I went to buy my copy of the game in London(! ), the first two specialist shops had no idea it existed and the third only stocked the series because a (male) staff member was a fan of the anime already. It would be interesting to know how well FUNimation's discs sold over there one day for comparison. I like to think that it fared better even though the dubbed SenBasa3 flopped just as much in both regions.